New version of di autobiography book of Nelson Mandela, Long Walk to Freedom, don come out for Johannesburg. Dare Not Linger na book wey focus on di years wey Mandela serve as South Africa president after di end of apartheid regime, and how im take see di first multi-racial election wey happen for di country in 1994. 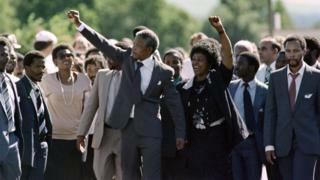 Mandela start to write di book but no complete am because of im old age and health matter. Na South African author Mandla Langa wey bi successful novel writer come add to di 10 chapters wey Mandela write to compete di book. Mandela spend 27 years for prison because im fight white minority people wey dey rule, and im later become di first South African president wey become leader through election. Him serve only one term for office. Mr Langa - who imsef bi activist wey fight against white minority people wey dey rule - use im own interview and research to complete di book. Im also use small small note wey Mandela write down. Di Nelson Mandela Foundation say di book na 50-50 collaboration between Mandela and di co-author. Dem take di title of di book from final sentence of Mandela popular autobiography Long Walk to Freedom, for where im write: "With freedom come responsibility, and I no dare tay on am, because my long waka never end." For June 2017, dem no release one book wey Dr Vejay Ramlakan, Nelson Mandela doctor write about di leader after Mandela family dem say di book get too much personal information of Mandela.